WILDSTAR™ Mezzanine Cards are designed from the ground up for superior density and analog performance. 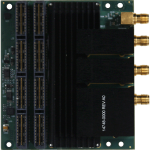 They includes 16 high speed serial lanes and over 96 LVDS lines to accommodate even the most bandwidth hungry PCI ADC or DACs. By providing far more voltages to the mezzanine card than competing form factors, noisy power supplies are eliminated from the noise-sensitive mezzanine card and moved to the baseboard, improving analog performance over competing options. With a taller stacking height, cooling is also improved as a larger heatsink can be used and there is also more separation from digital signaling on the baseboard. 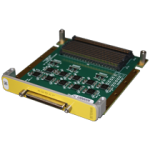 All PCI WILDSTAR Mezzanine Cards have fully tested FPGA interfaces to provide reliable data transfer between the two even at the highest sample rates and are qualified on Annapolis baseboards for reliable system integration. The WILDSTAR Mezzanine Card specification is open and customers can design their own proprietary cards if needed. 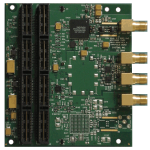 All Annapolis ADC/DAC boards deliver world class performance, allow for synchronization across multiple cards, and can accept external clock and trigger. Some cards also have on-board (internal) clocking options. On WILDSTAR 7 and WILDSTAR A5 baseboards, there is an option to populate three QSFP+ cages on the baseboard (1st slot) and then still use an WILDSTAR Mezzanine Card in a second slot. 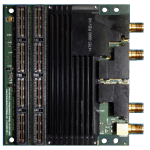 Since these cards generally have double-wide heatsinks for thermal stability, there are two PCIe I/O slots available which can both be taken advantage of with this solution. The QSFP+ interfaces can run up to 14.1 Gbps and each is capable of running a 40Gb Ethernet or QDR/FDR Infiniband interface (IP included with board purchase) or other high-speed protocol such as Annap Micro Protocol which is a low FPGA resource usage protocol with full flow control and variable line rate. The QSFP+ option is a manufacturing option chosen when the board is purchased. 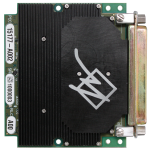 WILDSTAR Mezzanine Cards are compatible across the product line and can be swapped or upgraded as needed. There are some compatibility exceptions with older mezzanine cards being used on WILDSTAR 7 or WILDSTAR A5 baseboards due to FPGA technology changes. This high performance dual channel 2.3GSps DAC with three input bandwidth options, internal sample clock options and internal 10MHz reference clock options. 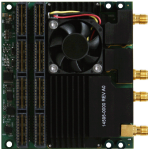 The WILDSTAR™ G2 Dual 4.0/2.7/1.6GSps 12-Bit ADC Mezzanine Card provides high fidelity and high speed analog-to-digital conversion along with a rugged design. This card is compatible with WILDSTAR 7 and WILDSTAR A5 mainboards. 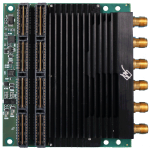 This extremely high density JESD204B 16-channel ADC has all channels synchronized across card and ability to synchronize across multiple cards with a high precision trigger. Software selectable internal or external clock. 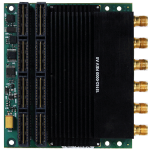 This high performance dual channel 2.5GSps or single channel 5GSps ADC with three input bandwidth options, internal sample clock options and internal 10MHz reference clock options. Compatible with WILDSTAR™ WS4, WS5, WS6, WS7 and WSA5 mainboards. This high performance dual channel 1.5GSps ADC with three input bandwidth options, internal sample clock options and internal 10MHz reference clock options. Compatible with WILDSTAR™ 6 and WILDSTAR A5 mainboards. 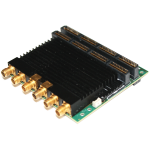 This high performance Quad 500MSps 14-Bit ADC can use either an internal or external sample clock and includes a high precision trigger for multi-card synchronization. 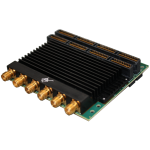 This high performance 4.0 GSps DAC has selectable frequency response modes, internal or external sample clock and includes a high precision trigger for multi-card synchronization.